Yotvata has announced that on a certain number of 1.75 liter cartons of enriched milk (bar code 290105966018 , expiration date 16/2/14), the weight of the carton was not listed. There is no problem whatsoever with the milk and it is safe to drink. Yotvata is collecting the cartons from the shelves. Those who purchased the product are asked to call 1-800-291-291 for more information and to receive compensation. Go to Friskies’ web page, enter your name, email, and address to have a voucher mailed to you for a free pouch of Friskies cat food. Strauss Achla salads is offering free tours of the Machane Yehuda shuk in Jerusalem. The are tours on Friday 24 Jan and 31 Jan filled up too quickly for me to post. In the meantime until they open more places next week, you can check out their interactive virtual tour of the shuk here. Everyone knows that the fast lane is really the slowest in the store. So what do you do while waiting? Check out everyone’s basket, of course- does anyone actually have under ten items? And what is the rule anyway- are three cucumbers one item or three? Does it go by barcode or units? That isn’t the real reason for the delay, though- it is the payment. For some reason this line has people who count out each coin, have trouble deciding which credit card to use, or G-d forbid- write a check! No matter what, payment in the fast lane takes longer than checking out a full wagon in the regular lane. Since when must you perform this task? But since we are polite Anglos, we are willing to help out a fellow Jew and save her spot. The only problem- she isn’t gone for only a minute and a lot of people show up wanting to be “after you” on line. Somehow you end up battling complete strangers for a place behind you for someone you never met before and STILL hasn’t come back! You finally get to put your items up, and they are finally rung up and in bags. You excitedly present your 70 agorot coupon you got from Facebook to the cashier. She takes one look at it and her face falls. Or she doesn’t even look at it- she says “kupa reishit bilvad” (main register only). If you convince her otherwise, she takes it from your hands with a look of disgust and closely examines it from all sides. Then she attempts to swipe it. BEEP! Doesn’t work. Again- BEEP! Doesn’t work. She tries typing in the bar code number- BEEP! She calls the main cashier. At this point, over 10 minutes have passed, the cashier is disgusted with you, the people in line behind you are disgusted with you, and you are even disgusted with yourself. Finally it all works out and the 70 agorot is deducted from the bill. Congratulations- you really beat the system. The check has been around in one form or another for hundreds of years. But for some reason, for the cashier in the supermarket, this is the first time she has ever seen a check. Although some registers can print the sum on the check, or the date, or your name, or something, it ever seems to work. The cashier tries to put it in the wrong slot, it jams, and the main cashier has to be called. The person is then taken to the main register to present his teudat zehut and get approval to use a check, but just then the electronic approval system is down. Next time just pay with gold coins. In the store I frequent there is one cashier that I studiously avoid, even if she has no line. But she is never empty, because each customer spends over half an hour with her. Why? Because each item in your wagon is cause for comment, joke and discussion. Presenting your club card generates a complete stand-up act. Then she asks you to donate to impoverished children and explodes in a long sad diatribe about how miserable they are and how you alone can save them. Truly her talent is wasted in the supermarket. If you just have that one item, why don’t you go to the fast lane?? OK, we know why she doesn’t. Again, us nice Anglos want to help other MOT so we let her go. Of course, then her credit card doesn’t work. Or she decides to pay by check. Or her husband calls and tells her of the five other things she forgot- “I’ll be right back!” Another ten minutes or so have passed when she finally finishes. However at this point the whole store received the message that you are a Nice Guy and there are three more people asking you to go in front of you. Harumph. I already complained that my supermarket took out the self-serve registers, but they are still in many other places. They were installed with the idea to save the consumers time (and the supermarkets money), and for the most part, they do. Until you get the person in front of you who can’t figure out how it works. Do you press or swipe? Why do you have to press? Do you weigh the vegetables before you press or after? Is a tomato a fruit or vegetable? Where do you put the coins in to pay? How do I pay by check? There might be someone standing by to help or not. And she may help. Or not. I have a system for putting my items on the counter- heavy/light, dairy/meat, coupon items in the end, etc. I am very proud of my system and await the attention of the cashier. Before she has a chance to look at me, the person behind me starts pushing my items forward to make room for his and even puts them on top of mine! Hey! What is the rush? Yours can’t go through until mine are off and bagged! Plus I really don’t want to pay for your items as well- keep them back! Other the other side of the cashier, there is the person who finished paying but still hasn’t packaged her shopping and left. First she has to check the bill (good idea but not here). Then she makes sure the milk isn’t expired. Then she gets a phone call and is so involved she doesn’t bag her groceries. In the meantime the cashier is moving my groceries along into a large pile (remember my specific placing of each item) and they get mixed with hers. I get so distracted with keeping them separate and keeping the guy behind me’s stuff separate from mine that I haven’t packed and paid the way I wanted to. 10. The 10th plague is left for the readers- what is your supermarket pet peeve? Check which stores each coupon is valid at. Not valid online. Not valid online. Must be printed. A routine check by Misrad HaBriut discovered the presence of Listeria monocytogenes in Matias Hollandi herring in oil. The 250 gram product can be identified by the bar code number 729003648078 and has expiration dates of 13 Apr 2014 and 15 Apr 2014. These bacteria can cause abortions in pregnant women and illness in people with depressed immune systems. Pal Dagim is removing this product from the shelves. If you have the product at home, you are asked to call 03-9067744 and to return it to the store. Misrad HaBriut has elected to start its anti-fat campaign “Efsharibari”-“Healthy is possible” with bread. The “Efsharibari” sign can also be posted in bakeries, supermarkets, cafes,etc that use healthy bread. 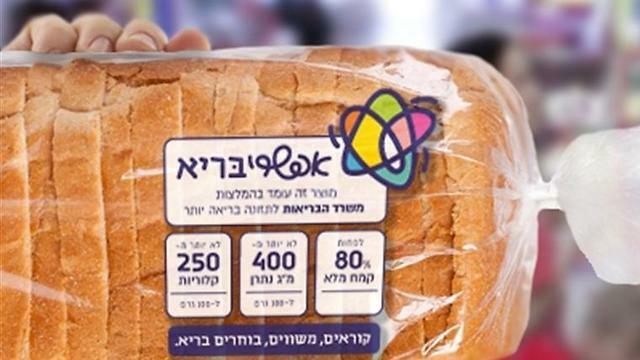 Deputy Director General Dr. Boaz Lev spoke with Ynet about the new teken (standard) for healthy bread. You can watch it here: lechem bari. One of the points he mentioned is that you can’t judge healthy bread by its colour- there are caramel colours that are permitted in bread that have nothing to do with whole grains. The point of the “Efsharibari” campaign is to encourage weight loss in Israel and to support manufacturers in producing healthy food. Of course, the question I and many others have is this: if they are trying to encourage healthy eating, why don’t they have healthy bread subsidized like the relatively unhealthy lechem shachor? Boaz Lev says that they are trying to put a maximum price on healthy bread but so far they have been unsuccessful. So, what is it worth to you? How much more are you willing to pay for healthy bread?